The following is a short reflection by Rev. Marta Benavides that was published recently in a book titled: Global MOSAIC: Favorite prayers and reflections from inspiring world humanitarians and given the context of CSW 56 this year I thought it would be appropriate to share it as we begin to process the work ahead. This is also a reflection that I went back to meditate on later today as I participated in a powerful conversation with a group of women discussing the use of the word empowerment within the context of women and equality. What was particular interesting was how these long time veterans actual saw empowerment as a diminishing word because it doesn’t fully capture the power that everyone is and our ability to excercise that power. Lots of food for thought. Blessings on the journey looking forward to the remaining week and half at CSW 56. Rev. Marta Benavides was born and raised in El Salvador. She was responsible for setting up the first refugee centers and for much of the humanitarian work organised by Monsignor Oscar Romero, who died a martyr in 1980 during El Salvador’s civil war. Throughout this armed conflict (1980-1992), Marta worked nationally and internationally for a peaceful solution which was eventually achieved through United Nations peace accords. As leader of the Global Movement for Culture of Peace, Marta works ecumenically and with secular groups educating people for a culture of peace. Committed to social transformation, Martha’s focus is on peaceful relations with all humanity, and care for Mother Earth (www.museoaja.org). The Lord’s Prayer appears in the Bible, the sacred book for all Christians around the world, as it was taught by our Brother Jesus, to be in communion with Our Father. For me, it is the most important and symbolic prayer. It also affirms all of Jesus’ teachings. I call it the Our Father and Mother Prayer, in order to recognize both the Father and Mother presence in the Creator Spirit, and I recite it now as an affirmation not as a wish nor as a request, but in recognition that all has been given to us already by the Great Spirit. You have forgiven us, since the beginning. You never lead us into temptation, but you give us a life that challenges us to grow in wisdom and grace, thus you do not have to deliver us from evil for you are my and our light, if I so choose it, thus no evil is in my path and life. For, I am in you as you are in me. And so it is. This prayer, and the way I understand it, is fundamental to how I lead my life and ministry, understand the relationship with the Higher Spirit, and the way I understand how the Higher Spirit relates to humanity. Therefore, my ministry is about a responsible, caring relationship with each other, Mother Earth, and the Divine Being. This prayer affirms the ‘how and why’ we are on earth; how we must go about manifesting God’s will here ‘on earth as it is in heaven.’ I affirm that this is our call and challenge – to discern and manifest God’s will in real time and intentionally here on earth. 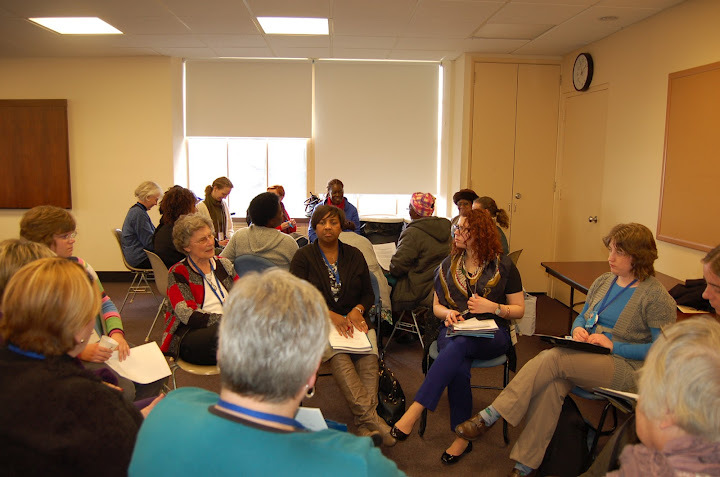 Cindy Eschliman from Hutchinson, Kansas but currently studying at Austin Presbyterian Theological Seminary had the privilege of participating in CSW for the second time this year with the National Network of Presbyterian College Women of PCUSA. She takes a moment to reflect on her time here and retells a funny story for which she is now known as the lady with the big coat that got the elevator stuck at the Church Center for the United Nations. 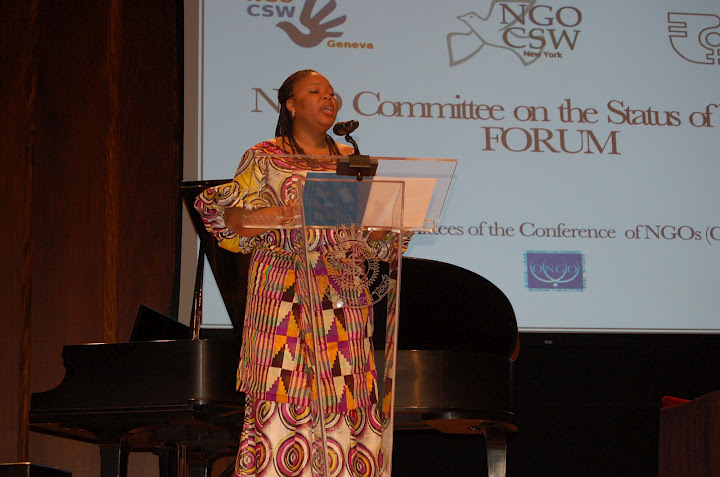 Margryette Boyd from Aurburn, AL and here at CSW 56 with a delegation from Racial Ethnic Young Women PC, USA. Margryette gives a few remarks on the contradiction between a commission focusing on women’s equality and the prevalent realities of male dominated leadership within the United Nations system. As I sat in the Women, Spirituality and Transformative Leadership workshop, I was reminded of the power of influence and expectation. Two mentees described their introduction to the Women of Spirit and Faith Group. No one asked them for their credentials. They were not required to pay their dues first before they could have a voice that was valued within the larger circle. Rather, they were accepted as leaders with gifts to bring to the larger group. They were surprised by this reception as many of us would be if we all had this experience. We know the unwritten rules of advancement, acceptance, and gaining respect in our society. The ethos of the group, brought to mind what happens when we imagine “that we can do all things through Christ Jesus who strengthens us?” What happens when we internalized that “the one who calls us also equips us for that in which we are call?” I left that experienced inspired to see people already equipped, already in process, and already blessed. In the days ahead I will look to see what difference this will make as I encounter others. I will consider more deeply what will happen within me if I assume this new position of the faith. My experience so far at the UNCSW has been really informative, and I’ve been coming away with expanded knowledge about women’s issues and great NGOs that I hope will continue to inform my interest in social justice. But one thing has been bugging me. I’m coming to the UNCSW as a pretty privileged middle class white girl with little personal experience with prejudice. I’ve been extremely lucky to be presented by great opportunities, and surrounded by strong women who have helped support me. My concern is that any aid or work I might want to do in another culture (or even domestically) would be met with skepticism due to my lack of experience with what they’re going through. It’s almost like a catch-22. I want to help, but I’m afraid I won’t be able to without seeming elitist. But I can’t sit back and do nothing, because doing nothing is worse. But then I attended Leymah Gbowee’s panel discussion yesterday, and she said something that completely reassured me. “There might be people who should occupy the space that you do, but need help getting there.” Hearing about the work that she’s done, and the kind of person she is, I knew what she was saying was exactly right. It reminded me that even if I can’t immediately get a job with an NGO and work abroad, there’s plenty I can do in my own community to create helpful, empowering opportunities for women and girls right where I live. I’ve still got a lot to learn, but Leymah’s inspiring words are helping me make strides! I’ve been Increasingly dismayed about the state of the world – until today. Four thousand women are gathered in and around the United Nations this week and next to address the challenges faced by rural women from around the world. Yesterday Michele Bachale, former president of Chile, reported on the first year of UN-Women, the new organization which she heads. Her words were appreciated, but she was also challenged almost immediately by Nobel Peace Prize Laureat, Leymah Gbowee, of Liberia to connect faster with civil society, with women on the ground. Leymah expressed the impatience that rural women from Egypt to Japan to Colombia to Gambia are feeling. They are determined to break through the barriers that have held them in poverty, invisibility, violence and fear. They are on the move and they will be heard! This morning I listened to a discussion of an individual woman in rural Panama who is fighting to keep the rain forest in Darien from being destroyed by tea plantations. These mono crop plantations are pushing local farmers off the land. Next, four women who are connected through Women’s Federation for World Peace, spoke about projects they have designed in Mongolia, Haiti, Philippians, and Cameroon. The first speaker, an American living in Oregon, connected with a woman from Mongolia who lives in her town. Together they have started a scholarship fund that has allowed 20 rural Mongolian women to go to university. I look forward to learning more and more about what is working in the days ahead. Leah reflects on her “Ah-ha moment” of the CSW. The 56th Commission on the Status of Women (CSW) at the United Nations (UN) is gathering from February 27 through March 9 to discuss and debate this year’s theme of “the empowerment of rural women and their role in poverty and hunger eradication, development, and current challenges.” The commission will develop a set of “agreed conclusions” that offers priorities for member countries in their work to improve the lives of women. The commission meets with a different theme each year and draws up a set of conclusions. The NGO community provides statements to the Commission which help the body to create a starting document from which it works throughout the two weeks. A group of women gathered last Saturday, through an organization of religious NGOs called Ecumenical Women at the United Nations (www.ecumenicalwomen.org), to review the document as it relates to hunger. They discovered that while the document names nutrition and food security as issues in the introductory materials, nutrition is not brought up again in the recommended actions for the countries. Nutrition is critical, especially for women and children in the window between pregnancy and the child’s second birthday. Without proper nutrition, pregnancy is more risky, children can suffer from permanent cognitive and physical delays that can ultimately lead of a 2-3% reduction in GDP in countries where malnutrition is widespread. It is particularly important for women to know the importance of nutrition and have the power to choose healthy food both in the market and in their farms. Ecumenical Women is advocating for including language about nutrition in both the food security and the health sections of the agreed conclusions. They will advocate for these changes as they meet with country delegations to the commission and as they ask questions in briefings offered by these country delegations. 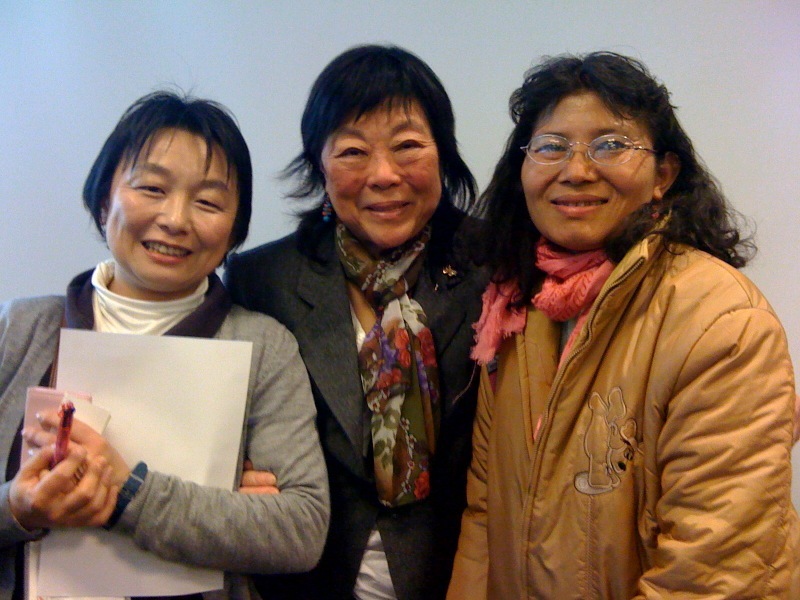 (L to R) Arakawa with Peng, a volunteer at the Presbyterian Ministry to the UN, and Myah, a delegate from Myanmar. She words for the Kaya Phu Baptist Association. Arakawa, from the Asian Rural Institute, spoke on rural farming in Japan and the empowerment of women farmers. Of special interest is the emphasis on organic farming in Japan, which young farming couples are able to organize into productive enterprises. Watch Karen Neely’s reflection on this event below. If you are interested in more information on this topic, Karen recommends Richard Louv’s book Last Child in the Woods, and Better Off: Flipping the Switch on Technology by MIT grad Eric Brende. 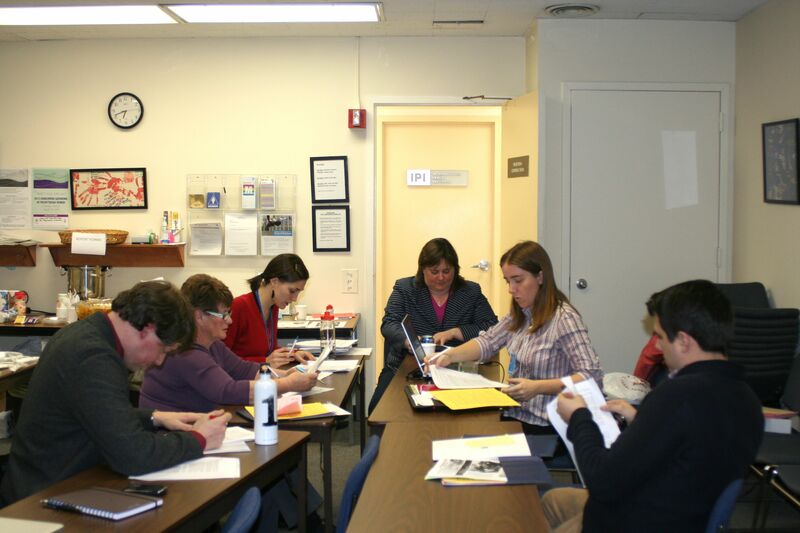 The Advocacy Team has been hard at work this late afternoon and evening. Some have had to leave; some have come back. Did you learn about the “Doctrine of Discovery” in your history class? Sarah Eagleheart and Elsie Dennis have a thing or two to teach us all. Come and join us for a Rural Women’s Speak Out with UN Women.